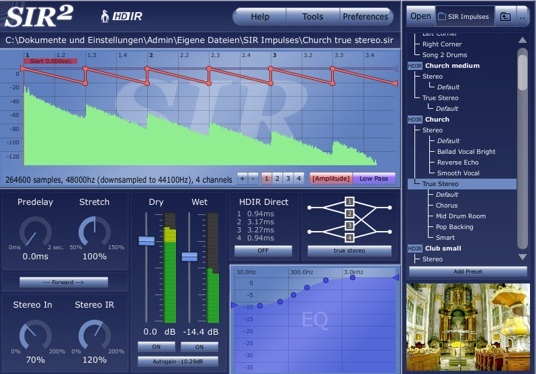 SIR2 is an easy-to-use audio-plugin that provides high-quality reverberation. It offers zero-latency processing with low CPU-consumption and non-destructive audio processing of impulse responses. SIR2 includes high definition impulse responses (HDIR) of *real* places produced by Pinguin, Hamburg. You can also import impulse responses from free or commercial sources. Includes Pinguin's High Definition Impulse Responses. "True Stereo" processing (a stereo convolution takes place for every source channel (left + right)). High-quality internal sample rate converting. Separate dry/wet control (-60db .. +20dB). Stretch control (high quality resampling). Stereo In / Stereo IR Control. Imports WAV, AIF, FLAC, BWS, OGG file formats. the setup installs the plugin-binaries into "/Users/UserName/Library/Audio/Plug-Ins" instead "/Library/Audio/Plug-Ins"
Improved performance when merging two big files into a true stereo file.